Well, it's still Saturday and I managed to get this post up before the day is over! 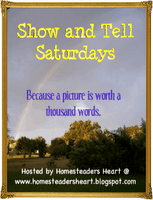 My friend Kim at Homesteaders Heart hosts Show and Tell Saturdays. This week's theme is your favorite kitchen gadget. Stop over at Kim's to see what everybody else liked! Kim had lots of great kitchen items and I do agree that my Kitchen Aid Mixer is one of my favorite things. I've had it just over a year and can't believe that I baked and cooked so many years without one! It cuts the cans around the side, just under the top so the gross top of the can never comes in contact with your food. Also, the cut edges aren't sharp! And you can carefully place the top back on the can and store it in the refrigerator if you need to. It really is best with a demonstration and I will try to get a video demonstration uploaded here tonight or tomorrow. I can never go back to regular can openers - LOL! What is your favorite kitchen gadget? Don't forget to stop by Kim's to see all of hers! I, for one, am so glad that you shared this! I was noticing today, that I need a new can opener. ...and the electric ones are NOT my friend! LOL! I like the hand held ones best and I will have to look into a pampered chef one like yours! :) I appreciate the tip! Very nice. I wants it. Sorry, we have just finished wathcing the extended version of Lord of the Rings trilogy. Anyway, my favorite gadget has to be a food processor. I rarely use it for processing, I use it and have gone through many of them for shredding cheese for Casa Dillas. Thank you for keeping the chocolate in my life. LOL This is too funny. 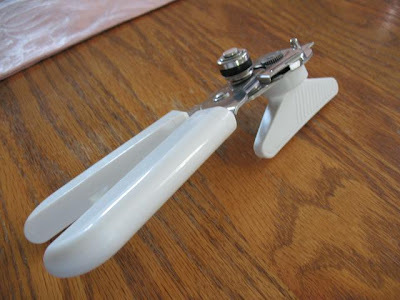 I just bought a "battery" operated can opener today that cuts around the edges. Apparently all you have to do is set it on there and push a button and it does it for you. I'm all for that and saving my wrists LOL. I'll let you know how it works I haven't tried it yet! That does sound cool my friend! We have one of the regular ones. I might have to look for the Pampered Chef one. I have a PC spatula that I love. Gotta love PC! It's really fun watching my friends who visit try to figure it out! But once you learn to use it, you can't imagine doing it any other way. I have one like this too! It's not Pampered Chef, but it still works great, and I love it! Oooh, I want one! I think between the chocolate and the can opener, all I can do is drool over your site! I'm glad to have found it!